Most hyacinths have recently suffered the ignominy of being take out of the garden and put into the forcing shed to become interior decorations. 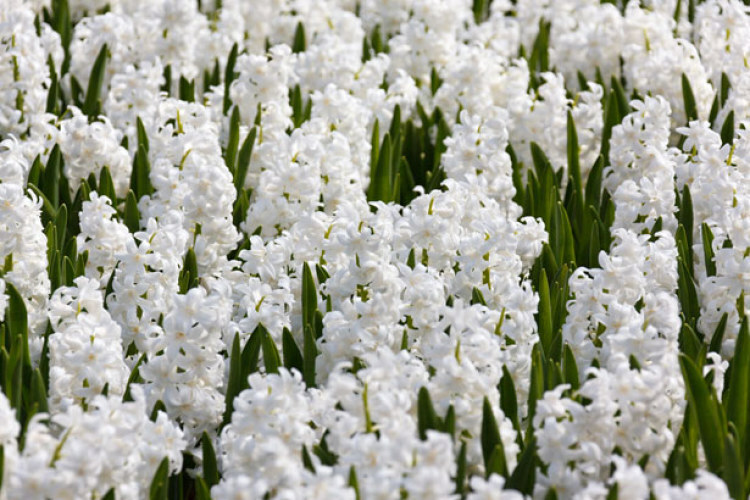 In the garden they are easy, trouble-free bulbs and even a small group of them will fill the slightest breeze with a heady scent. The luminescent flowers of this variety brighten the grey days of March. After a few years the stems are never as packed with flowers as those on supermarket shelves, but the looser, relaxed appearance makes the plant a more comfortable companion to early-flowering perennials. At Anglesey Abbey in Cambridgeshire the tradition of bedding out hundreds of hyacinths, begun in the early part of last century by Lord Fairhaven, is carried on by the National Trust. The planting is formal, regimented and stunning. A short drive away is a National Collection of hyacinths. You smell the collection, grown in a two-acre field, a long time before you see it.